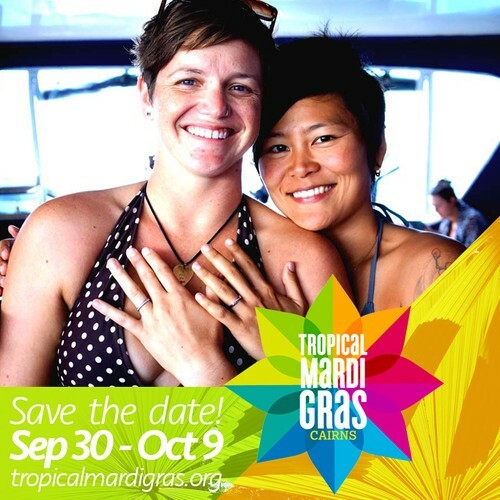 Tropical Mardi Gras, Cairns, invites you to come and show your love in paradise! Every Year, Cairns Tropical Pride welcomes visitors from around the world to join us for ten days of play in the gorgeous environment that is Tropical North Queensland. From dance parties to dive trips, from fine dining and fashion shows to beaches and rainforests, culminating in our Fair Day at the superb Tanks Arts Centre, Tropical Mardi Gras has something for everyone in our rainbow family. Nestled between the majestic world heritage listed Daintree Rainforest and the Great Barrier Reef, Cairns is rich in natural wonders. Cairns also has a large, active and creative LGBT+ community, a thriving international travellers’ scene, and five star services. Come for entertainment, adventure, connection and relaxation, all in an idyllic festive environment. Dance, meet, mingle, dine, explore, swim, snorkel, dive, discover, create, enjoy, chill, cuddle, dance some more and show your love in paradise!